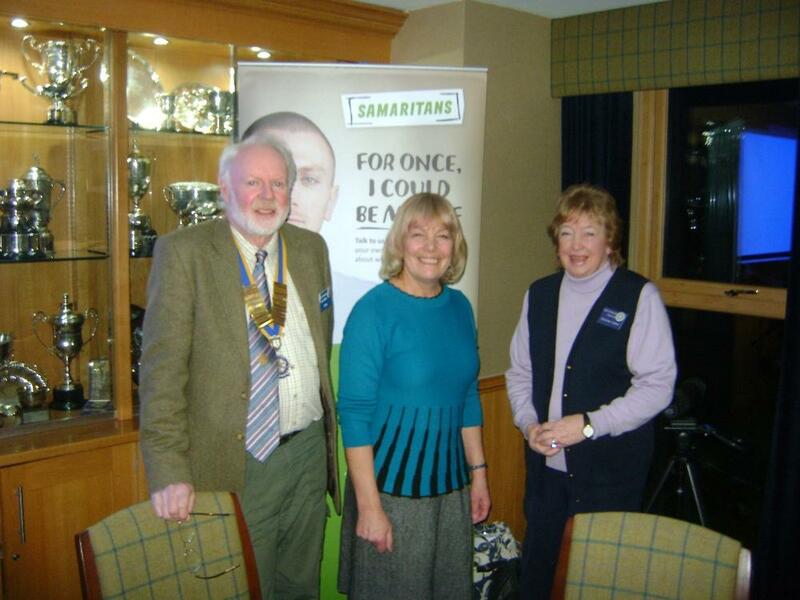 Judith Jarden from the Samaritans was the guest speaker at the club meeting on Wednesday 22nd February. Her inspirational and though provoking talk gave members an excellent insight into the origins of the Samaritans in the 50’s and how it is run today. The vision is simply that “fewer people will die by suicide”. In Scotland there are over 1,000 volunteers across 19 branches including Orkney in the far North. In Scotland alone they receive over 300,000 calls and text calls for help each year. The organisation depends upon donations to fund the work of the volunteers who so tirelessly offer hope and encouragement to those who find life such a trial. In Scotland, despite their support being available 24/7, over 670 people took their own lives - a suicide rate higher than the rest of the UK as a whole. 3/4 of such deaths in Scotland are men and mostly under 50 with a growing trend towards 20 to 30 year olds. Judith’s talk was much appreciated and the club members were keen to note the need for support when funds become available. Picture shows Judith (centre) with President John Chambers and member Fiona Risk.